This instrument can convert the Saybolt viscosity to Engler viscosity and kinematic viscosity automatically. Operator can get three viscosity data from one test. The work efficiency is high. 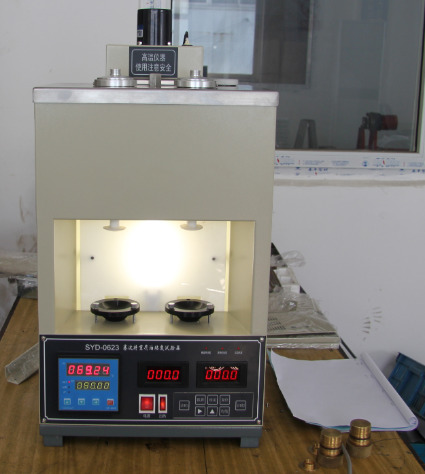 T 0623 Bitumen Saybolt Viscosity Test (Saybolt Viscometer Method) in the JTJ052 Standard Test Methods of Bitumen and Bituminous Mixtures for Highway Engineering. It is suitable to determine the Saybolt viscosity of bitumen and bituminous mixtures under a constant temperature as per T0623. 1. 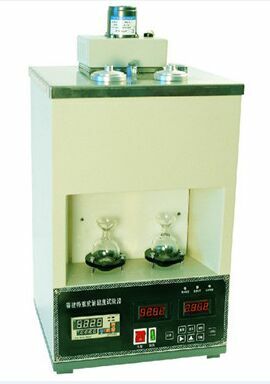 This instrument is composed of bath, temperature controller, parameters display and calculation(calibration coefficient, time, viscosity and so on). 2. This instrument adopts micro computer technology.It equips double lines to detect.It can determine two samples at the same time. It can display the parameters and calculate the arithmetic mean value automatically. 3. This instrument can convert the Saybolt viscosity to Engler viscosity and kinematic viscosity automatically. Operator can get three viscosity data from one test. The work efficiency is high.